Earn $7.22 in Rewards credit (722 points) What's This? Filling out Challenge's line of impressive event tires comes the Strada Bianca 30, an extra wide road clincher that's purpose built to take you where skinny tires won't go. In and of itself, a the Bianca's 30mm contact patch does wonders for traction, handling and comfort. But next, challenge equips the Bianca tread, updated to be lower wearing, with light grooves which run from shoulder to shoulder. The textured surface isn't as aggressive as their Almanzo tire, so it's faster on the pavement, yet maintains traction over hard packed dirt, rough roads, and -- you guessed it -- gravel. A 260 TPI casing further improves handling, and Challenge's latest PPS-2 puncture protection manages to keep out sharpies and resists pinch flats using two barriers -- one directly beneath the tread, and one inside the casing. 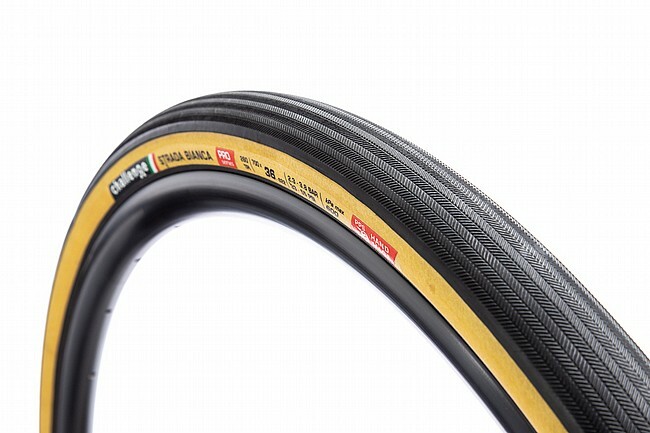 The Strada Bianca 30 Open Tubular Road tire is available in 700c x 30mm (30-622 ISO). Folding bead. Black sidewall. Claimed weight: 355g.